Responding to requests from students, California State University Northridge’s Delmar T. Oviatt Library is expanding its operating hours. The new schedule, which went into effect last month, now keeps the library open until midnight Monday through Thursday evenings, and also has the library opening at 11 a.m. instead of noon on Saturdays. Library dean Mark Stover said these extra hours will fulfill the requests from students for longer hours. “These new hours will be especially useful for those students who work and take classes during the day and then must use the library in the evening hours,” he said. For more information on the Oviatt Library’s hours and resources visit its website at http://library.csun.edu/ or call 818-677-2285. Cal State Northridge’s Oviatt Library provides educational, cultural and information services and resources to students and faculty. Its primary mission is to support and supplement classroom and independent learning; facilitate student and faculty research; and provide students with lifelong skills in identifying, locating, evaluating and synchronizing information. All library materials are housed in the Oviatt Library, a 234,712-square-foot, state-of-the-art facility. Of note are the Collaboratory with its 175 multipurpose computer workstations, three computer-equipped library instruction labs with a total of 100 computers, and 150 computer workstations, in various library locations, devoted to library information resources. There are over 1,600 seats for in-house study. 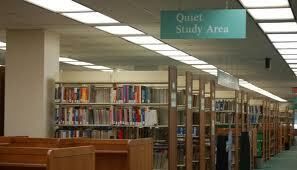 The library maintains and provides access to electronic information 24 hours a day. The Oviatt Library has a physical collection containing 1.4 million volumes, of which more than 1.1 million are books, and more than 250,000 bound periodical volumes. The Library subscribes to 53,000 online journals, more than 2,300 print journals, over 200 online databases and nearly 275,000 ebooks. The microform collection contains 3.17 million pieces. There are more than 14,200 sound recordings, 12,700 film and video recordings and nearly 60,000 pictures and other graphic materials. The archives and manuscript collection exceeds 4,200 linear feet of materials, with nearly 38,500 items housed in Special Collections.